Wargrave Local History Society's visit to a place of historic interest this year was to Bletchley Park, the home of the wartime codebreaking team. The large site has benefited in recent years from Heritage Lottery funding, enabling the restoration of several of the surviving buildings, which are themselves of historic interest. They also house displays about the work done at Bletchley Park, and were opened to visitors during 2014. The site was developed with a large mansion in the 1870s, and the house, together with the estate around it, was bought in 1883 by Sir Herbert Leon. It remained a family home until put up for auction in 1937. The Government acquired a large part of the estate, including the mansion, in 1938, and soon built the first of many wooden huts there. These, and the house, then housed the Government Code and Cypher School. Its rural location meant it was less at risk from wartime attack, but it also had easy access from Oxford and Cambridge as well as London. The displays and exhibits do not only show the work carried out at Bletchley Park. To show the challenges the codebreakers faced, there are examples of the machines used by the German forces to code their secret messages. Although known as Enigma machines, there were several variants, used by the army, naval or air forces, and also the German Secret Service. The 'simplest' of these had 3 rotors which encrypted the message being sent. The rotors could be set to any one of 159 million, million million combinations - and the particular set up was usually changed daily - and was different for each of services that used Enigma machines. The machine advanced the rotor positions as each character was typed - so if the letter E was encrypted as Q the first time it occurred in a message, it would be something different the next time it occurred. The idea for such machines was not new - they had been invented in Holland in 1915 for the secure transmission of information by banks. Machines had been bought by Britain, so the way it worked was known. The problem was to work out what the particular day's settings were - for each of the four services. The codebreakers used a combination of the technology of the time, 'brainpower' and 'intuition' to solve what at first seems an impossible puzzle. However, there were some 'standard phrases' that were likely to occur in a message, and as the German's did not use numerals, the word 'eine' was likely to occur quite frequently. If such 'patterns' could be discovered, the day's code could be unlocked. To be effective, the messages had to be decoded (and then translated, of course) quickly. The task of checking the enormous number of possible Enigma machine combinations, however was formidable if the content of the intercepted message was to be of use. The way forward was a machine known as a 'bombe', developed by Alan Turing and Gordon Welchman. This - in effect - was a motor driven set of enigma type wheels that could run through all the possible combinations, and would then stop if a 'possible match' was found. It might also stop if there was a machine fault, so the results needed further interpretation. Because at the end of the war, all the 'bombe' machines were broken up, the way for this to be shown was for the team at Bletchley Park to build a working replica. The machine would be set up based on the 'crib' - the intuition based on the 'standard phrases' etc. Although well known, the Enigma was not the only coding machine in use. 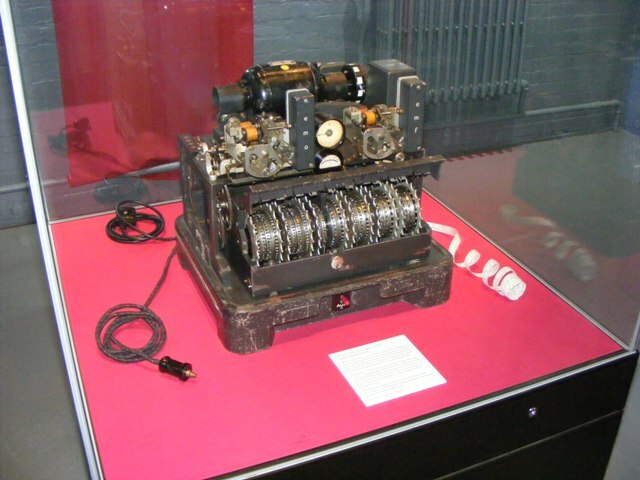 The Lorenz, for example, used 12 coding wheels to encrypt teleprinter messages. Two of the wheels controlled the movement of five of the others - a complex machine made code. By a stroke of luck, when a message was re-sent using the same code settings, but put in abbreviations to save time, John Tiltman, the cryptanalyst, was able to crack the message. The way in which the machine worked was then deduced by Bill Tutte - even though he had never seen one! The complexities of the coding system, however, made it virtually impossible for humans to decode the messages. As a result, Tommy Flowers, an electronics engineer who worked for the Post Office was given the task to solve - he developed Colossus - the world's very first programmable computer. Such was the secrecy at Bletchley Park, that many staff did not know the relevance of their part in the process. In turn, the reports that were sent out were written as if they had been obtained by spies, to hide the fact that coded messages were being intercepted. The displays at Bletchley Park show the process - from the German coding machines to the British decoding processes; biographies of some of those who worked there; the social life of those who worked on decoding the messages, and the methods of getting messages back to be decoded - be it by pigeon or motorcycle dispatch rider. In addition, there are several interactive displays, where visitors can experience for themselves some of the basic problems of decoding messages. The foundations of our local history are the soil and rocks beneath us - affecting the crops that grow, the minerals available for buildings, and so on, so the Society will resume its programme of after the summer break on Tuesday, September 8th, with a talk on the Geology of Bowsey Hill, and then on Tuesday, October 13th, Roy Sheppard will recount the History of Postcard Collecting - how it began and how it has changed over the years, whilst on Tuesday, November 10th Anthony Poulton-Smith - the author of a recent book on Berkshire's Place Names, will explain their origins, meanings, and how they have changed.